You can register online (we print a show directory for you) or at the Embroidery Mart event at the Cobb Galleria Centre in Atlanta. Register by 5 PM EST December 31, 2018 to be entered in the drawing for a free night at the Renaissance Hotel! Register to attend an exclusive 4-hour workshop on Thursday, before Embroidery Mart-ATLANTA. If you register to attend the workshop before Embroidery Mart, it is $30/person. Registration is $50/person on the day of the workshop. Do you want to follow your dream of starting a business? Thinking of changing your career direction for something more creative while working for yourself? Embroidery could be your answer! This workshop is designed to shed light on the startup process and answer the questions you may not even know you had. See additional by clicking on the section for Classes. Attend any of the free classes at Embroidery Mart-ATLANTA on Friday and Saturday. You do not need to register to attend a specific class on these days, simply show up for the class with your 2019 Embroidery Mart-ATLANTA name badge. Seating is available on a first come, first serve basis. Classes* are listed below. The information will be updated as the presenters finalize their presentations. Learn how to properly maintain your embroidery machine (any brand) for smooth operation! Tips, tricks and the importance of your design for faster cap production. Understand the wide variety of stabilizers used in the embroidery industry. Learn how to correctly hoop unique items such as leather, dog leashes and much more. Learn the basics of being profitable in the custom apparel and decal business. If you have a heat press and vinyl cutter, you’ve got everything you need to get started! This is an excellent class for anyone wanting to start or grow their apparel or decal business. You’ll learn proven strategies from Matt Vassallo, entrepreneur and owner of The Rhinestone World, who started his business in 2006 doing the very same thing. Don’t reinvent the wheel. Learn from someone who’s been where you are, add your unique creativity along the way, and get your business on the road to success! In this seminar, you’ll learn: Producing rhinestone and vinyl products using a vinyl cutter and heat press, marketing your products to your target new consumers, and growing your customer base. In this class, you will discover how to transform your business with this second-to-none software! Maybe you’ve considered starting a vinyl and rhinestone business or adding these elements to your existing business but thought it’s too difficult to learn. The beauty of the TRW Design Wizard™ is that it’s developed in collaboration with apparel and decal business owners just like you to make for a user-friendly experience—no complex functions that only programmers know how to use. Plus, users receive ongoing training and support from our collection of free tutorials covering each feature of the software in addition to live or recorded webinars presented by our TRW trainers. Since this software is a macro built on top of CorelDRAW®, a leading graphic design software that many in the industry already use, the TRW Design Wizard™ is an inexpensive option for your business. The TRW Design Wizard™ also contains shortcuts and features that will save you time with other vector art you may already produce and allows you to integrate rhinestones with other media such as vinyl to create increasingly popular multi-decoration products. It also includes fully customizable business features including a cost calculator, top-of-the-line mock-up creator and generator, and easily-customizable monogramming options to help cater to your audience. Growing your Profits by Printing On Site! Learn how to source, stock and produce successful events on site. We will teach all of our time-tested procedures on how to not only grow your company but most of all grow your profits. Are you currently turning away or outsourcing screen printed apparel orders? Well Stop! Come heat print your first screen printed t-shirt and take the first step to growing your business with screen printed apparel. Art? No problem. We will demonstrate how to use our free online art designer. Money saving tips will be taught on how to maximize your transfer sheet with ideas to upsell your customer. We will also show you some easy solutions to common decorating problems. There is more than apparel that can be screen printed as well, all while your embroidery machines are still running!! Please join us for this fun filled, hands on experience! A vinyl cutter is the most versatile production machine in the apparel decoration and personalization industry. This class will outline a set of best practices for maximizing both sales and productivity with a vinyl cutter. The class will focus on design and production skills in CorelDRAW using the Digital Art Solutions Multi-decoration System. The class with also key on specific and meaningful sales and marketing strategies for maximizing sales. Four popular processes will be featured. Apparel decoration and monogramming with heat press vinyl and popular films including glitter vinyl and metallic films. Vinyl graphics including decals, banners and signage. Rhinestone multi-decoration using the stencil technique invented by Digital Art Solutions. Applique using the revolutionary DRAWings X embroidery, applique and monogramming software. With the introduction of the revolutionary DRAWings vector to stitch conversion program, digitizing is no longer required to create production-ready sew files from vector art. Discover how to convert vector artwork produced in CorelDRAW, Illustrator or other vector graphics programs into perfect embroidery, applique and monograms. Learn the process of preparing vector artwork in CorelDRAW for the conversion process. Learn how to reduce or eliminate out-sourced digitizing and spontaneously convert vector clipart and logos to a file that will run perfectly on your embroidery machine. This class is designed for anyone that wants to become more productive and profitable with their embroidery equipment. A comprehensive class explaining the different types and styles of the most popular embroidery backing on the market. Learn about the uses and functions of different backing styles. Get backing insights from an industry leader. Learn Maintenance tips including proper oiling and cleaning on your PR series machine. Go over settings and color change options. Discuss backing types and features along with the differences and uses of stabilizer and specialty backing. Test and try hooping aids including Mighty hoops, Hooptech Clamping systems and Durkee frames. See the use of hooping aides and techniques along with new industry products including embroidery software choices. Explore the basics of embroidery digitizing. Learn the techniques to create quality designs using the proper stitch settings and methods. Go over creating Appliqué designs using different methods and materials. Discuss the settings and techniques for creating "puffy" foam designs including settings and applications. Has a customer ever asked you for branded products other than apparel? Ever turned business away because you didn’t offer non-apparel products? Discover how to never turn a sale down again by becoming a promotional product distributor. ASI has a network of over 3000 suppliers that can provide fully decorated products to your customers at an average profit margin of 35% to you! Learn ways ASI supports our promotional product distributor members with sourcing products, presenting quotes, tracking orders and generating electronic PO’s all within one system to help you save time and make money. Never say no to a customer again! Come learn how. Digitizing: Should you do it yourself or have someone else do it? Financials: Do your own bookkeeping or work with a CPA? This special workshop is sponsored by SewingMachine.com and presented by industry expert and veteran Paulette Bell. * Class dates, times, presenters and subjects are subject to change without prior notice. All class participants must be registered for Embroidery Mart and be at least 14 years old. What will you discover at Embroidery Mart? Click the green box below to open a partial list of the vendors that will be exhibiting. Come to the NNEP’s trade show ready to do business with the suppliers. Prepare a wholesale/credit application that includes all the pertinent information about your company, such as your federal tax ID#, credit references, companies with whom you already have Net 30 terms established. Download, complete and bring copies of this Wholesale Account Application. Walk the entire trade show once. If you have time after that, walk it again, going in the opposite direction. Sounds strange, but many folks see things they missed the first time around! If an exhibitor is busy, stop back when you can have the access and time you need to make sure that all your questions are answered. Look at how products are merchandised, get ideas for your business. We update this list as the Exhibitors finalize their contracts. If you want to see a particular supplier at Embroidery Mart-ATLANTA, please email us! We’ll connect with that supplier and invite them to exhibit in Atlanta. Keep in mind that by registering for this event you are giving consent to the participating vendors to send you information about their products and/or services. Please note: all young and future apparel decorators must be at least 14 years old to enter the exhibits or classes. 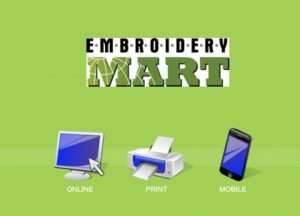 Are you interested in SELLING your products or services at Embroidery Mart-ATLANTA? Click EXHIBITOR INFORMATION for available booth locations and exhibitor information or call NNEP at 800-866-7396 and ask for Jennifer. Embroidery Mart-ATLANTA attendees and exhibitors stay and save at the Renaissance Waverly Hotel which is connected to the Cobb Galleria Centre, making this the MOST convenient hotel for you! Register to attend Embroidery Mart by 12/31/18 to be eligible for the drawing for a free night at the Renaissance Waverly! If you have trouble making hotel reservations online, please let us know. You’ll find plenty of things to do in the area around this exciting area just outside downtown Atlanta. Experience the trendy Battery, a lively neighborhood with numerous bars, restaurants, and shops. You can also walk to Akers Mall. Visit the Cobb Galleria Centre's Parking & Directions page HERE for details. CONNECT with other embroidery professionals and apparel decorators! For many embroiderers and apparel decorators, you often work in “isolation,” in more ways than one. Many folks do not really “get” what you do, even among your own family and closest friends. Even if you have a storefront, at times it is just you and the equipment. Isolation is one of the hardest hurdles for you to overcome as a business owner! If you are isolated, where do you get new ideas? Who can you ask when you have questions? How can you generate possibilities for fresh solutions, fresh ideas? Join the conversation, become part of the community – load up with new ideas, new friendships and new ways to think about your business. You will be very glad you did! Discover how to GROW Your Business! Ready to make money (or more money) with apparel decoration equipment – embroidery, screen printing, digital garment printing, laser engraving, rhinestone setting, heat presses, sublimation? Get recognition for the industry-specific knowledge and expertise you acquire at Embroidery Mart! This program will be launched at Embroidery Mart-ATLANTA. "Love the show! Love the variety of classes offered and demonstrations of new products. I loved the new venue too!!"